Farmersgirl Kitchen: Rice is nice, but cheesecake is better! 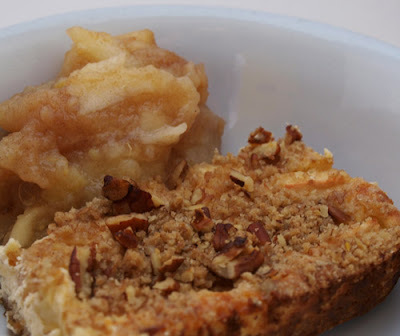 and followed it with more spiciness of the sweet and spicy kind, are you seeing a theme to my weekend cooking lol, I decided to make the Apple Streudel Cheesecake from Judy's Kitchen. My measurements were slightly haphazard as I didn't have the right amount of cream cheese, but it turned out beautifully and was absolutely delicious, I served it with the rest of the windfall apples that a friend of my MIL's had given me. Thanks for that one Judy, it's a keeper. Takes 45 - 55 minutes. Serves 6 with plenty for seconds. 1. Heat the oil in a large wok or pan, then tip in the garlic, onion, chilies and choizo and fry for a cople of minutes until the onion has softened and the chorizo has released some of its oil. 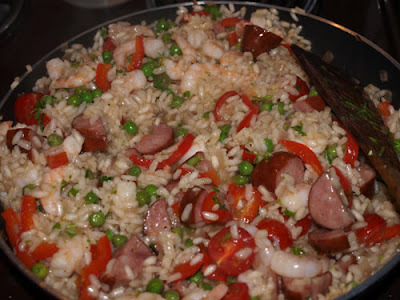 Add the rice and paprika, give a good stir, then pour in the wine and bubble vigorously until the wine evaporates. 2. Pour in the stock, then lower the heat and cook gently for 10 minutes, stirring occasionally. Tip in the beans or peas, season with salt and freshly ground black pepper and cook for another 7-10 minutes, stirring, until the rice is tender. Keep an eye on the water level and have a kettle of boiling water at the ready in case you need to add a spalsh or so to keep the rice moist. with a mixed leaf salad. mmmmm oh they look scrummy. What a great idea for a cheesecake! Looks very scrummy. So glad you liked the cheesecake, Janice. Thanks for sharing. That rice dish looks so scrumptious!! I like the rice more then cheesecake! Apples, cheesecake, prawns...be still my heart.